The definition of El Niño(La Niña) is such that the 5-month running mean Sea Surface Temperature (SST) deviation for NINO.3(5°S-5°N,150°W-90°W) continues 0.5°C(-0.5°C) or higher (lower) for 6 consecutive months or longer. The NINO.3 SST deviation is defined as deviation from the latest sliding 30 year. The SST data set is COBE-SST made by JMA. Winter, spring, summer and autumn mean December to February, March to May, June to August, and September to November, respectively. Thin lines indicates monthly mean values, and smoothed thick curves represents five month running mean values. 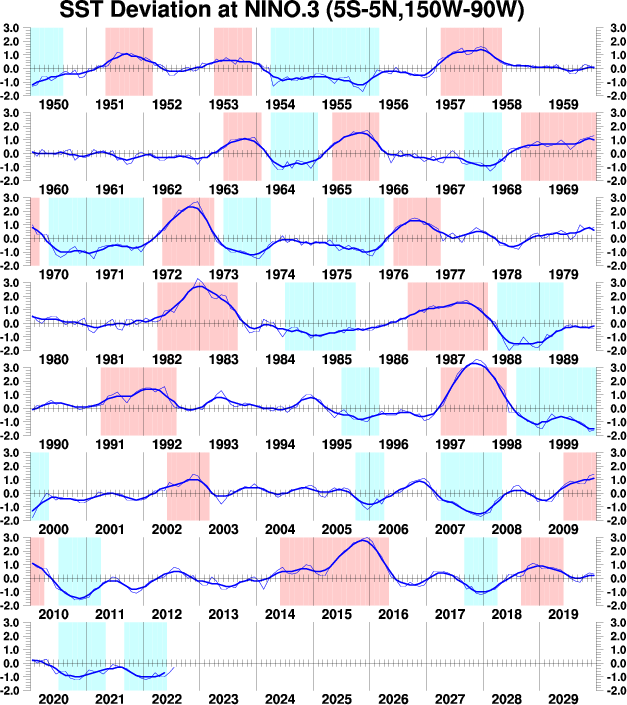 Red shaded areas denote El Niño periods, and blue, La Niña ones.